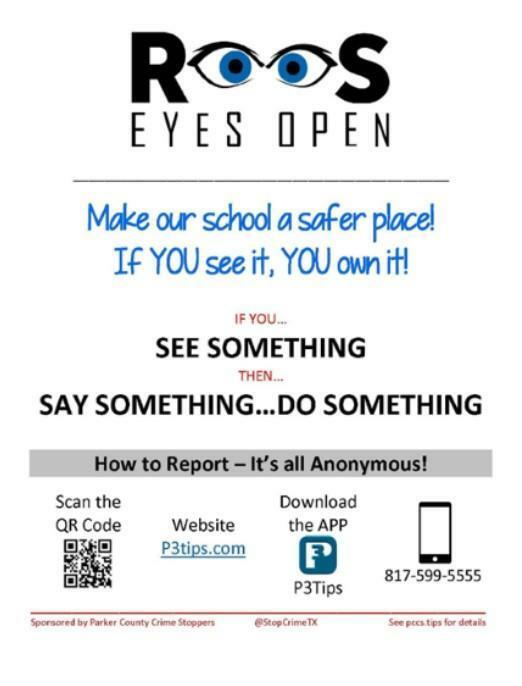 Safety and Security » Roos Eyes Open - IF YOU SEE SOMETHING SAY SOMETHING! Roos Eyes Open, in partnership with Crime Stoppers, is a three-part approach to solving the crime problem. Crime Stoppers relies on cooperation between the general school community, police, and the media to provide a flow of information about incidents in the schools, including bullying, drugs, theft, and other possible unsafe situations. A person sees something that is not safe and does the right thing by choosing to report! Tips are received by the Parker County Crime Stoppers unit. These reporting methods do not provide the ID of the individual or provide the IP address of any computer. Conversations are not recorded. The Crime Stoppers Police Coordinator receiving the information completes the tips information form, makes initial inquiries and then passes the information to the appropriate Weatherford ISD staff. The reporting processes are completely secure and anonymous and are very effective and efficient means of safely communicating in today's world. By guaranteeing a reporter`s anonymity, Crime Stoppers allows the caller to give information in a positive atmosphere without the prospect of retribution. It pays to the right thing! By offering cash rewards for information leading to indictment or arrests, the program encourages otherwise reluctant callers to provide information. The very unique integrated Two-Way Dialog capabilities in the online tip process allows the tipster to come back and provide additional information to their tip at any time, but also provides a secure means for the coordinator to ask questions or provide reward information back to the tipster through the same secure and encrypted interface. You will be given a number at the end of the reporting process. Do not lose this number! You must have this number to pick up any reward that may be offered. A community board of directors, made up of persons from throughout the area, meets on a monthly basis to evaluate incident resolutions and arrests to decide on the size of rewards to be paid. Rewards are then distributed in a private manner to the callers. Get involved and help us make our schools and community safer!